I am very proud to have written this story. When composer James Horner was, tragically, killed in a plane crash last year, few knew that he had already written the main themes for his next assignment, the all-star remake of The Magnificent Seven — even though shooting hadn’t even begun. His longtime collaborator Simon Franglen (whose work with Horner went all the way back to their Oscar- and Grammy-winning Titanic) decided, with the approval of director Antoine Fuqua, to complete the score using those themes as a starting point. He reassembled the Horner team — including orchestrator J.A.C. 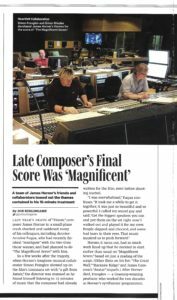 Redford, mixer Simon Rhodes and their music editors — and made it happen. For this story in Variety, I interviewed Franglen, Fuqua and Redford (with L.A. recording session photos by Dan Goldwasser). This entry was posted in Composers, Film Music, Interviews and tagged Antoine Fuqua, J.A.C. Redford, James Horner, Magnificent Seven remake, Simon Franglen, Simon Rhodes, The Magnificent Seven, Variety on September 22, 2016 by Jon Burlingame.